The historian’s task involves unmasking the systems of power that underlie our sources. A historian must not only analyze the content and context of ancient sources, but also the structures of power, authority, and political contingency that account for their transmission, preservation, and survival. But as a tool for interpreting antiquity, "authority" has a history of its own. As authority gained pride of place in the historiographical order of knowledge, other types of contingency have faded into the background. This book’s introduction traces the genesis and growth of the category, describing the lacuna that scholars seek to fill by framing texts through its lens. 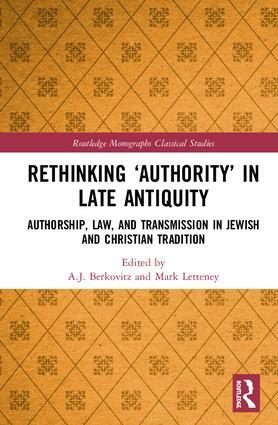 The subsequent chapters comprise case studies from late ancient Christian and Jewish sources, asking what lies "beyond authority" as a primary tool of analysis. Each uncovers facets of textual and social history that have been obscured by overreliance on authority as historical explanation. While chapters focus on late ancient topics, the methodological intervention speaks to the discipline of history as a whole. Scholars of classical antiquity and the early medieval world will find immediately analogous cases and applications. Furthermore, the critique of the place of authority as used by historians will find wider resonance across the academic study of history. "This book delves into two of the most crucial themes in contemporary critical theory: authority and transmission. The essays cover a a wide variety of themes in Jewish and Christian textual history, but share one mission: to revisit, question and complicate the common (mis)conception that subjugates transmission to authority, and sees the latter as the key to the former. This superb collection is essential reading for anyone grappling with questions of literary transmission, authority in literature, and the complicated connections between them." CHAPTER 1: A.J. BERKOVITZ AND MARK LETTENEY, "AUTHORITY IN CONTEMPORARY HISTORIOGRAPHY"
CHAPTER 2: HINDY NAJMAN, "READING BEYOND AUTHORITY"
CHAPTER 3: MARK LETTENEY, "AUTHENTICITY AND AUTHORITY: THE CASE FOR DISMANTLING A DUBIOUS CORRELATION"
CHAPTER 4: MATTHEW D. C. LARSEN, "CORRECTING THE GOSPEL: PUTTING THE TITLES OF THE GOSPELS IN HISTORICAL CONTEXT"
CHAPTER 5: AJ BERKOVITZ, "BEYOND ATTRIBUTION AND AUTHORITY: THE CASE OF PSALMS IN RABBINIC HERMENEUTICS"
CHAPTER 6: MARIA DOERFLER, "GLIMPSES FROM THE MARGINS: RE-TELLING LATE ANCIENT HISTORY AT THE EDGES OF THE LAW"
CHAPTER 7: JONATHAN A. POMERANZ, "CONCEALING THE LAW: THE LIMITS OF LEGAL PROMULGATION AMONG THE RABBIS OF BABYLONIA"
CHAPTER 8: EVA MROCZEK, "TRUTH AND DOUBT IN MANUSCRIPT DISCOVERY NARRATIVES"
CHAPTER 10: SARIT KATTAN GRIBETZ, "CONSUMING TEXTS: WOMEN AS RECIPIENTS AND TRANSMITTERS OF ANCIENT TEXTS"
A. J. Berkovitz is Assistant Professor of Liturgy, Worship, and Ritual at Hebrew Union College - Jewish Institute of Religion, USA. His forthcoming book focuses on the reception and practice of the Psalms in Late Antiquity, and explores issues related to book history and the Jewish-Christian encounter. Mark Letteney is a PhD candidate in Princeton’s Department of Religion, USA. His dissertation considers the effects of Christian governance on scholarly practices in the late fourth and fifth centuries. He is also an archaeologist, co-directing the Solomon's Pools Archaeological Project in Palestine.